Preheat oven to 350 degrees F. Combine flour, soda, and salt and set aside. Cream together shortening and sugars until fluffy. Add vanilla and eggs and beat well. Add flour mixture to shortening mixture and mix until blended. Stir in chocolate chips and walnuts. Drop by heaping tablespoons onto an ungreased baking sheet, about 2 inches apart. Bake 10-15 minutes or until lightly browned. 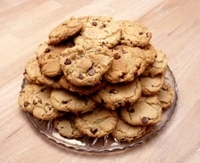 Remove from the oven and place cookies on a cooling rack.